So many benefits for your business, increased brand awareness, low cost connections, increased leads and most importantly, sales. But what about the downside of an online presence? The more you grow your online presence, the more your website becomes a juicy target for hackers. I don’t enjoy scaremongering, but data security breaches are a real threat. Estimates suggest that the worldwide cost of cybercrime will increase to $2 trillion by 2019. Despite this, 87% of CIOs believe their security controls are failing to protect their business. Here are some of the ways that your digital marketing strategy might be leaving your business vulnerable, and how you can fix them. While most accidental status updates are nowhere near as catastrophic as what US Airways posted in 2014, mildly inappropriate or unprofessional content will still erode the integrity of your brand. Hootsuite recommends using a style guide for social media containing instructions for your tone of voice, images used and preferred methods for interacting with followers. Everyone who posts on behalf of your brand should read the document thoroughly and receive proper training. One mistake can have a long-lasting impact, so only entrust your social media channels to your most trustworthy employees. When an employee posts something inappropriate on social media, it’s likely to be accidental – but if a hacker takes over your account, you can expect some serious hostility. 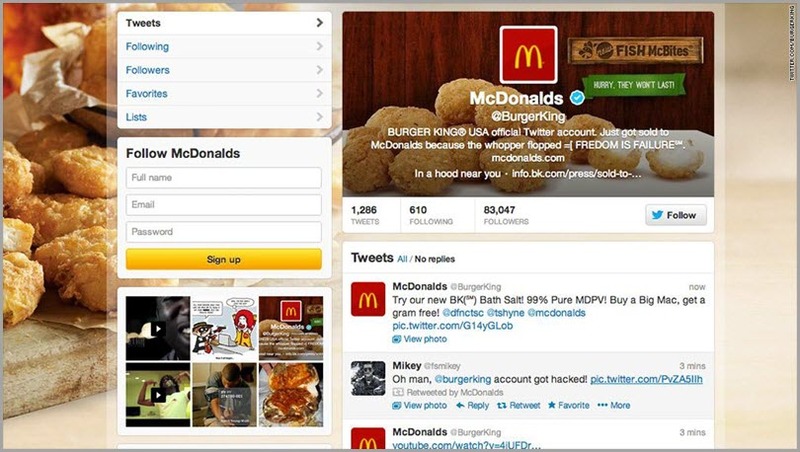 A few years ago, a hacker took over the Twitter account of Burger King and rebranded it to look like McDonald’s. After posting a string of absurd tweets, the account was eventually suspended. It’s believed that a weak password choice for Burger King’s account enabled this breach to take place. Be careful when you mention your location on social media. If you’ve made it clear that you’re away from your home or office and won’t be returning anytime soon – this is an invitation for thieves to perform a robbery with a lower threat of being caught. Numerous soccer players have had their houses raided because their fixture list is public and thieves know exactly when they’ll be away from home. Thieves are appreciative of status updates that tell your whereabouts. To keep yourself safe, never mention how long you’ll be away for and consider waiting until you get back home before posting your photos from exhibitions, trade shows and lectures. 80% of retail professionals state that email is their most effective tool for retention marketing. Despite this, email has some notorious vulnerabilities. In what was thought to be the largest email breach in the history of the internet, Epsilon became famous for all the wrong reasons. This is the type of negative publicity your business doesn’t need. Research indicates that 63% of data breaches are due to poor outsourcing decisions. Outsourcing comes with tremendous benefits. You don’t have any of the overhead costs that come with in-house employees and you can select skilled, affordable workers from the international labor market. However, before you choose to outsource your email marketing, ensure that the agency or freelancer has security protocols inline with your own. The cost of a data breach is never worth the money saved on digital outsourcing. As an email marketer, you’re also a data gatekeeper. The more customer data you have stored, the more you’re at risk – so only solicit the essential information that you need and nothing more. Always encrypt emails containing sensitive information. This prevents eavesdroppers from gaining access. Don't get caught being uprepared with a disater strikes. Companies like Frontier Business can offer your whatever you need to make sure your hardware and networks stay up an running.